U.S. voters largely disapprove of a measure in the Republican health care bill meant to encourage people to maintain health insurance coverage, a new Morning Consult/POLITICO poll shows. The poll finds nearly two-thirds of voters (64 percent) don’t think the bill should include a provision making adults pay a 30 percent higher premium if they postpone buying health insurance for more than two months. Only 18 percent of voters support that measure, while the same number had no opinion or didn’t know. The provision is the most disliked among the individual aspects of the bill included in the poll. Nearly half (46 percent) of voters responded that they somewhat or strongly approve of the bill in general, while 35 percent said they somewhat or strongly disapprove of the measure, dubbed the American Health Care Plan. The continuous coverage provision is meant to encourage younger and healthier people to stay in the insurance pool, driving down premium costs. It’s the Republican alternative to the Affordable Care Act’s individual mandate, which requires people to pay a fine for not having coverage if they don’t qualify for an exemption. Voters somewhat support the Republican plan to repeal the ACA’s mandates. Half of respondents said a repeal should be included in the AHCA, while 37 percent said it shouldn’t. Conservative critics have argued the GOP‘s continuous coverage provision is too similar to the ACA’s mandate, since people who don’t maintain coverage would pay a penalty to insurance companies rather than to the government. Another major difference from the ACA is the Republican proposal to replace income-based subsidies with age-based tax credits. Here, voters are more divided, with 39 percent thinking it should be included and 34 percent disagreeing. The bill’s most popular provisions are actually protections that were first part of Obamacare. More than two-thirds of voters (68 percent) support allowing young adults to remain on their parents’ health insurance until they turn 26, while 19 percent disapprove. An even larger number, 71 percent, support a provision barring insurance companies from denying coverage to patients with pre-existing conditions. 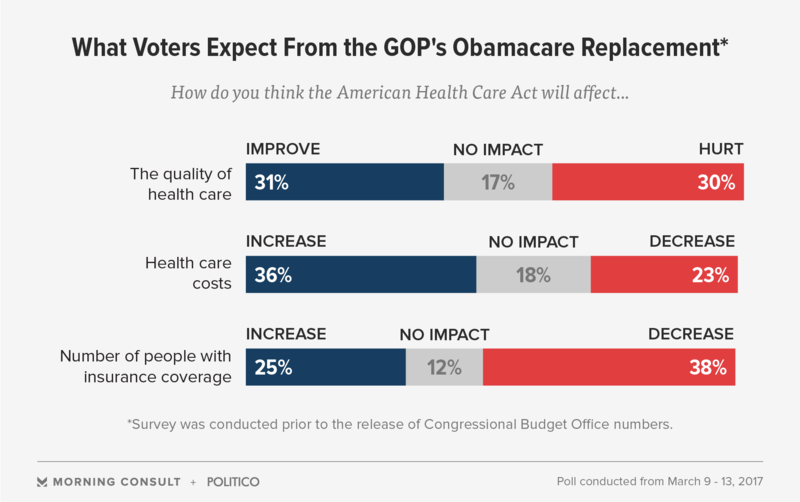 Voters appear undecided on what exactly the Republican health legislation changes. Just over a quarter of voters (27 percent) say the bill doesn’t go far enough in changing the health system, while 24 percent say it goes too far. Another 17 percent say it goes just far enough. Those polled are also split on how the GOP’s measure would affect the health care system: 34 percent of voters say it would make the system better and 33 percent say it would the system worse. Meanwhile, 31 percent of voters say the bill would improve the quality of health care in the U.S. and 30 percent say it would hurt quality. The poll was conducted March 9-13, before a Congressional Budget Office score showing 24 million more Americans would be without insurance coverage under the bill, though it would decrease the federal deficit. The legislation under question has been cleared by two House committees, and is set to be marked up by the House Budget Committee Thursday. House leaders hope to bring the bill to the floor as soon as next week. The national, online survey polled 1,983 registered voters. It has a margin of error of plus or minus 2 percentage points. See more here.